You are fat, and you can't lose weight — no matter how much you try. You can lose weight, a respected science writer says, but start with the fact that almost everything you have been told about obesity and dieting is simply dead wrong. 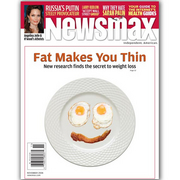 That's the attention-grabbing assertion from award-winning writer Gary Taubes that is examined in depth in Newsmax magazine's special report, "The Big Fat Lie: New Research Finds the Secret to Weight Loss." Taubes decided to probe why you can't lose weight and why — despite supposed improvements in nutrition and fitness — American are not only gaining more weight than ever but we also are witnessing an explosion of obesity-related diseases such as cardiovascular diseases, cancer, and diabetes. Taubes' findings were first revealed in the book "Good Calories, Bad Calories: Challenging the Conventional Wisdom on Diet, Weight Control, and Disease." The blockbuster book was largely overlooked by the media. But Newsmax decided to investigate. What we learned will knock your socks off. Taubes argues that our weight problem is simply the function of a change in the American diet over the past 50 years — when the medical community and food industry pushed for a heavy carbohydrate diet. 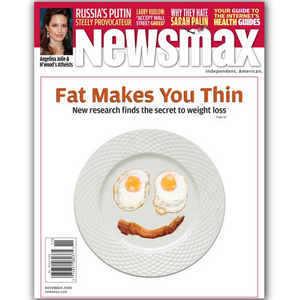 Taubes discovered that the human body actually craves animal fat — and that fats can actually make you thin. One of the "biggest public-health travesties in history"
The real "bad actors" in the human diet: Go ahead eat steak! Why the current outlook on diet is built "on a house of cards"
Sen. George McGovern's connection to the USDA's "food pyramid"